Voters in Africa’s most populous nation must choose between an ageing ex-military ruler and old-school political tycoon. Both are four times the country’s median age. Challenger Atiku Abubakar’s talk of relaxing the state’s economic grip at least has a whiff of the 21st century. 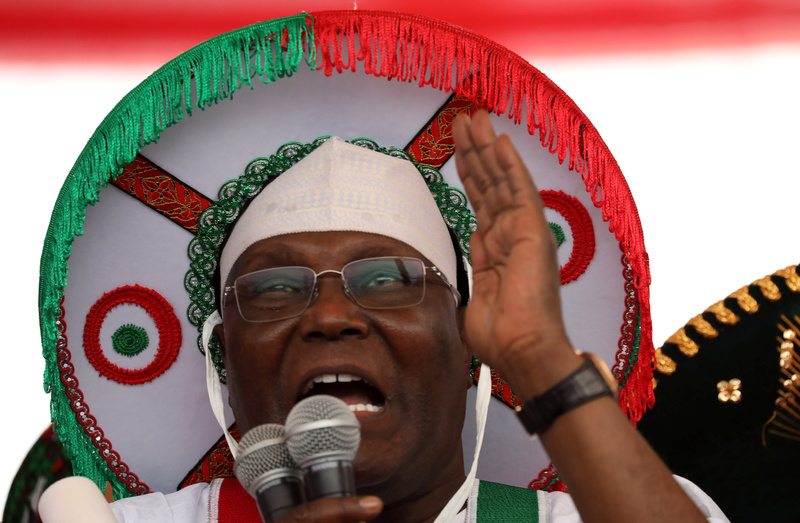 Nigeria's main opposition party presidential candidate Atiku Abubakar gestures as he speaks during a campaign rally in Lagos, Nigeria, February 12, 2019. Nigerians go to the polls on Feb. 16 to choose between incumbent President Muhammadu Buhari and opposition challenger Atiku Abubakar. Abubakar, who served as vice president between 1999 and 2007, has promised to privatise a range of state-owned firms, including the national petroleum company, and relax the currency’s fixed peg to the dollar. Opinion polls tend to be unreliable, but anecdotal evidence points to a tight race. According to the election commission, of the 84 million registered voters, 53.3 percent are from the north, where Buhari, who hails from the far north, enjoys strong support. Abubakar is also a northerner.